Smart Gas Metering Systems Market size will exceed USD 9 Billion by 2024, as reported in the latest study by Global Market Insights, Inc. Implementation of favorable government mandates and fiscal incentives toward intelligent gas meter deployment for accurate measurement of gas consumption patterns will boost the global smart gas metering systems market. In 2016, the Federal Council of Germany introduced the Digitization of the Energy Turnaround Act that stipulates all EU member states to equip 80% of its customers with smart meters by 2020. 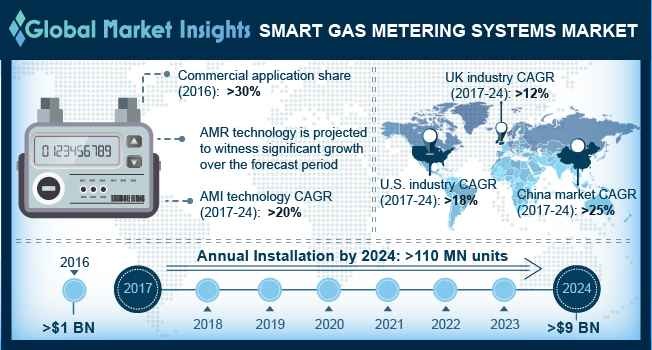 AMI smart gas metering systems market is set to reach over 20 million units of annual installation by 2024. AMI monitors consumption along with time and are designed to transmit the pricing information from the utility to the consumer. The implementation of these systems in the infrastructure can streamline the operations of utilities while reducing expenditures, extending services, and providing greater safety. U.S. smart gas metering systems market is projected to expand over 18% by 2024. Introduction of several state rollout programs and legislative directives for the deployment of smart gas systems will positively drive the industry outlook. In 2013, the U.S. Department of Energy (DOE), through its American Recovery and Reinvestment Act (ARRA) funded the installation of smart grid technologies in the country. Implementation of fiscal incentives coupled with government plans to roll out the existing meters will provide a substantial edge to smart gas metering systems market. Several countries have implemented distinct legislations that mandate the adoption of AMI meters as a part of their energy conservation initiatives. As per the Government of Great Britain, the replacement of 53 million smart meters is expected to be executed across residential establishments by the year 2020. Increasing demand for accurate billing along with real-time monitoring of consumption pattern will complement the global smart gas metering systems market growth. Intensifying conservation measures in response to scarce availability of resources will further stimulate the business scenario. Utility smart gas metering systems market is anticipated to witness growth owing to rising measures toward reduction of theft. Effective expansion of gas distribution facilities catering to the growing population base will further enhance the product penetration. Modernization of critical metering infrastructure to reduce operational expenditures and optimize operations will further boost the product demand. Growing measures toward optimizing operational efficiencies of utilities to address escalating consumer demand will propel the smart gas metering systems market. Ability to offer improved assets management and real-time consumption information will further strengthen the product demand. Increasing consumer affinity toward shared infrastructure communication for gas meters will further fuel the industry growth. UK smart gas metering systems market is projected to witness a growth of over 12% by 2024. Shifting trends toward digital economy and growing measures to attain environmental sustainability will stimulate the business growth. The EU Energy Efficiency Directive outlines the legal measures to step up the efforts of EU Member States to use energy efficiently at all stages of the energy chain. Notable players in the industry comprise of Badger Meter, Itron, Landis+GYR, Schneider Electric, Siemens, Sensus Sentec, Osaki Electric, Elster Group, Neptune, Honeywell International and Raychem.